Positioned on the eclectic High Street of Totnes, Rumour has been known by many names over the years; most recently named after the Fleetwood Mac album. Housed in a 14th Century building - previously playing host to a toffee factory and a jazz bar - it has spent the better part of the last century as a restaurant, gaining popularity and recognition from locals and visitors alike. 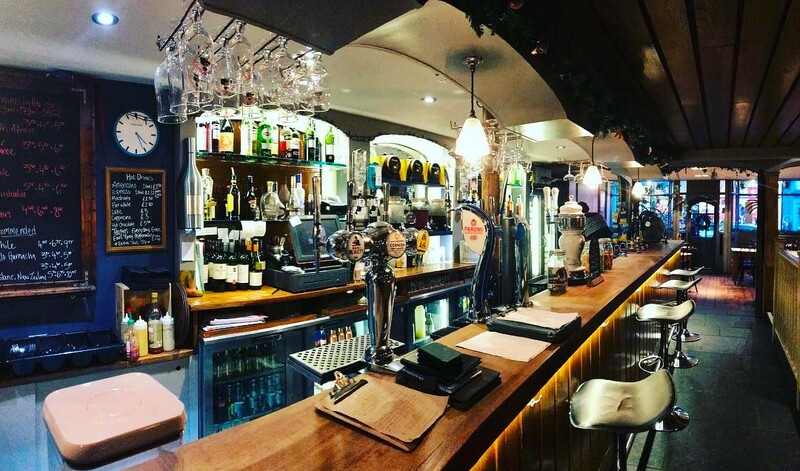 We are passionate about maintaining and improving upon our standards, continuing to please both our drinkers and our diners with local beverages and fresh, home-made seasonal food; as well as our renowned friendly, relaxed service. All our staff, from managers to kitchen porters work tirelessly and enthusiastically towards a common goal: for our customers to enjoy a memorable meal with us. Our local suppliers: MC Kelly, Brixham Seafish, Channel Fisheries, Annies, Ticklemore Cheeses, Devon Organics, Sharpham, Luscombe Drinks, New Lion Brewery, Challices. Great restaurant amazing food. Lee is an amazing chef! Lovely food and ambience, friendly efficient and knowledgeable staff, would love to visit  more, but live 300 miles away..  Will definitely visit next year. Thank you - we had a such a good meal with you last evening. Everyone said their food was delicious, there was a good choice of drinks available and the staff were friendly and efficient without being intrusive. Our Australian friends particularly liked having local wine from Sharpham. We loved our lunch at Rumour, and it's an interesting menu. A criticism... possibly too much sauce masking, not adding to, the flavours on both the pork (too sweet) and halloumi (too creamy). The rest was delicious. Been eating here for years and still my favourite place to eat. Wonderful wonderful wonderful! The food was gorgeous, and vast in options. The service was faultless and fast. The atmosphere was lovely, Rumour certainly attracts a nice crowd. We had a wonderful evening. I have been coming to rumour for years but this trip was the best so far. The food was outstanding, amazing flavours, cooked to perfection. The service was friendly, welcoming, relaxed but attentive. It is good value for money, a little bit pricey but you definitely get what you pay for. I have been telling everyone what a great meal we had with you. Thanks Rumour, you nailed it! Really Great to have online booking system. Customer service was great. Only down side was that our group found the food a bit too salty and the halloumi fries came out lukewarm, like they have been sitting there a while. Other than that, it has been very good experience! Yet another superb meal. LOVE Rumours. We had a lovely meal and the atmosphere was great. One small quibble was that initially we had to sit next to an extremely hot wall heater and were not allowed to move until the next table's reservation did not show up after half an hour. Unfortunately not our best visit. My mussels had raw garlic in it - which permeated the flavour and left a terrible after taste. My husbands steak was tough and sinewy we suspect it hadn't been rested properly. Normally Rumours is excellent....I can only assume the head chef was not in or something. Excellent night , great food and great atmosphere. On booking I noted some dietary requirements; these had not been passed on to staff who were unable to satisfy them. On arrival nobody greeted us, so we sat at a table with a reservation note with my name and the time. However, after a few minutes we were unceremoniously and abruptly moved to another table as apparently there were two Georges booked at 7pm and we were the wrong one. On delivering our food we asked for mayonnaise which was forgotten and I had to get up and ask at the counter for it. Our server was eventually apologetic but initially her manner was really rather unwelcoming. Lovely lunch with good atmosphere.